We’ve talked here plenty of times before about the numerous second generation bluesmen and women doing their parts to help keep their fathers’ music alive. So we were of course delighted to learn of separate new projects involving two true sons of the blues: Mud Morganfield, son of McKinley Morganfield, a.k.a. Muddy Waters, and Kenny “Beedy Eyes” Smith, son of longtime Waters drummer Willie “Big Eyes” Smith. And to make things even better, both Mud and Kenny have teamed with accomplished blues players with ties to their fathers for their latest releases, Kenny recording with legendary blues bassist and Big Eyes (not to mention Eddie King and Otis Rush) backer Bob Stroger, and Mud pairing with harmonica ace and Fabulous Thunderbirds frontman Kim Wilson, who Muddy once reportedly praised as “the greatest harmonica player to come along since Little Walter” while Wilson cites the elder Morganfield as his biggest mentor. With strong, confident vocals that could easily be mistaken for his father’s, it wouldn’t have taken a soothsayer to see that it was just a matter of time before Mud Morganfield put out an album paying tribute to his Pops. And while we’re personally still holding out hope that Mud and his brother-in-law Big Bill Morganfield will someday collaborate on an album as they’ve done live on several occasions, we have to say that Severn Records chief David Earl’s decision to add Wilson as a featured musician on the tribute project is easily one of the, well, best-sounding ideas we’ve heard in a long time. 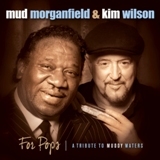 Featuring Morganfield and Wilson’s take on some of Waters’ most famous tunes – including “Still a Fool”, “I Love the Life I Live, I Live the Life I Love”, “Blow Wind Blow”, “Nineteen Years Old”, “Trouble No More”, “I Want to Be Loved”, “Just to Be with You”, “She Moves Me”, and “I Just Want Make Love to You”, For Pops: A Tribute to Muddy Waters (Severn Records) also finds the pair performing some of the blues legend’s lesser-known material, including a swinging “I Don’t Know Why” and the chugging “My Dog Can’t Bark”, with a superb band of Billy Flynn and Rusty Zinn on guitar, Barrelhouse Chuck on piano, Steve Gomes on bass, and Robb Stupka on drums helping to deliver some seriously deep, Muddy Waters Band-style grooves. Three songs in, these guys have already established that they’re just as good with the slow, creeping numbers like “Just to Be with You” as they are on such up-tempo shufflers as the opening “Gone to Main Street” and “I Don’t Know Why”. By the time they arrive at songs like “She’s Got It” and “Blow Wind Blow”, the band is clearly in top form, operating in a zone few others can rival. Recorded live in the studio in just four days – with the musicians all in one room and Mud in another, the release coincides with the 100th anniversary of Muddy’s birth – and honestly, we can’t think of a better, more meaningful tribute to him than this. 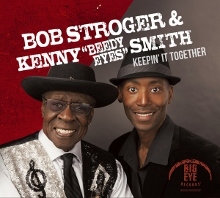 While drummer Kenny “Beedy Eyes” Smith‘s latest project may not at first appear to be as direct a tribute to his father as Mud’s, there’s no denying that Kenny and bassist Bob Stroger have very much captured the spirit and sound of Willie “Big Eyes” Smith on their collaboration Keepin’ It Together. In addition to including one of Willie’s songs (the funky, Booker T-ish “Old Woman Sweetheart”) in its original form (with Big Eyes himself on vocals) as well as another inspired by a dream of him, the project also appears on a label named in Willie’s honor (Big Eye Records) and features some of the same personnel who backed Willie on his own albums in guitarists Frank Krakowski and Billy Flynn and pianist Barrelhouse Chuck (with the latter two also having lent their talents on the Morganfield and Wilson album discussed above). Having both contributed to the Grammy Award-winning Joined at the Hip (Willie’s 2010 collaboration with fellow Muddy Waters band member and pianist Pinetop Perkins), Keepin’ It Together marks something of a triumphant return for the duo of Stroger and Smith, who, despite the decades of difference in age (Stroger is 74 while Smith is just shy of 40), are able to deliver a diverse, solid and fun collection of songs, from slow, creeping tunes like “What Cha Say” and a “Key to the Highway”-ish “My First Love” – both laced with some fine harmonica – to upbeat numbers like the swinging “He Took Her” (with Stroger apparently the “he” in this instance) and a shuffling “Clever Mama”. The pair takes turn on lead vocals throughout the project, with Stroger – who’s lived in Chicago since 1955 – getting things started to the tough Chicago sounds of “Born in Missouri” (on which Stroger sings “I was born in Missouri, but Chicago is my home”) before Kenny picks up the pace a bit with a gritty, fast-chugging “Losin My Mind”. Stroger again takes vocals for a groovy “Come on Home” featuring some nice saxophone from Sam Burkhardt, staying on mic for the peppy, piano-driven “That’s My Name” (“you can call me what you want to, but my real name is the blues”), followed by the swaying “Sweet So Sweet” that comes just a bit later, passing the mic to Smith for the funky, shuffling “Love and Affection” and the soulful closer “In My House”, a song inspired by a dream Kenny had of his father that the album’s liner notes touchingly describe as “Willie’s creation, given to Kenny as a gift”. One other treasure you’ll find here is the track “Old Woman Sweetheart”, which includes part of the song from Willie’s 2008 Born in Arkansas album – with Willie on vocals – in addition to adding in a verse with both Bob and Kenny. Muddy Waters Band harmonica player Jerry Portnoy trades off on harp duty with Joe Filisko, with Kevin Iles also contributing on guitar and Brian Leach assisting on bass; together, along with the aforementioned Flynn, Krakowski and Barrelhouse Chuck, they help provide a rich, full sound on top of Stroger’s and Smith’s impressive talents as the core rhythm section. It’s been nearly three years now since the passing of the elder Smith, one of the most missed voices and players in the genre today; fortunately for us, Kenny – who had already been carrying on his father’s tradition of the blues as a longtime background player on drums – is helping to fill that void by stepping confidently out into the spotlight, sharing it here with one of the true legends of the blues guitar world in Stroger. This entry was posted in Albums and tagged Barrelhouse Chuck, Billy Flynn, Bob Stroger, Frank Krakowski, Jerry Portnoy, Kenny Beedy Eyes Smith, Kim Wilson, Mud Morganfield, Muddy Waters, Rusty Zinn, Willie Big Eyes Smith. Bookmark the permalink.